About a year ago, Norton Motorcycles got a cash injection of over $5 million from the British government in an initiative to stimulate the country’s domestic engineering. Now it looks like that, along with the company’s own R&D investment, is going to crank out one hell of a sport bike. The concept of a new V4-powered motorcycle from Norton was announced back in 2015, but it has been confirmed by the company as a green-lit project this week. All the company has stated is that the bike will be powered by a completely new 1200cc four-cylinder engine in a “V” layout and run a tubular aluminum chassis. 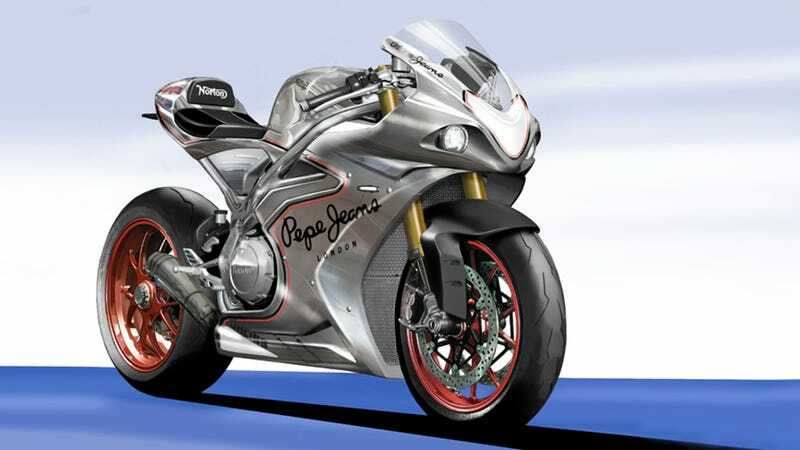 The bike will be built at Norton’s Donington Hall factory, with a “limited edition” first batch of 200. Its first public appearance is slated for the NEC Motorcycle Live in England in November with customer deliveries starting mid 2017. Asphalt and Rubber says the bike will put down “over 200 horsepower,” which they’re pulling from comments Norton’s Head of Design Simon Skinner gave BikeSocial last year when the idea for a new V4 was initially introduced. At the same time, the Ducati 1299 Panigale was called out as new Norton’s chief rival, and a target price was estimated at somewhere in the $30,000-range. Not a bike for your average enthusiast, then. But very few bikes can claim an output of over 200 horsepower, which is what this Norton is supposedly gunning for. “With a focus on drivability, character and design quality,” according to Skinner. We’ll probably get a few details teased out before the November reveal, so watch the wires as we watch the story.